This week on the Dead Games Society Podcast we discuss the old-school RPG Cyberpunk 2013 (yes, the hyper-deadly edition that came before Cyberpunk 2020). I interview Digital Dungeon Master Chad Parish (who runs Cyberpunk 2013 regularly at Cons) about the game and what its like to take mirrorshaded players into a world set in the distant dystopian future of Two-Thousand and Thirteen! 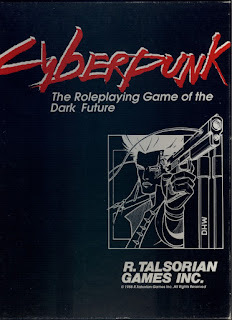 We also discuss Chad's fantastic answer to the ever-problematic Cyberpunk RPG question of (be it Shadowrun, Cyberpunk20XX, or other): "What do you do with all the meatspace mercenary characters while the one hacker player just wants to keep surfing the matrix?" Of course his solution is based on Neuromancer. Of course!